Meet Priapus Studio, a new Flemish game developer, operating from Gent. Priapus Studio is founded by 3 friends: Stijn Bouchier and Dave Van Verdegem with the help of the promising artist Stan Loiseaux. Priapus Studio frequently participates in game jams which results in creative game ideas. One of those game ideas became 42 Stories, currently in development at Priapus Studio. 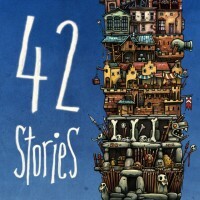 42 Stories is a simple, yet fun little game where you build a tower to reach the heavenly skies. Unfortunately you aren’t the only one building a tower, so you’ll have to build faster than your opponent… Or you could just shoot his/her tower down! While you try to get higher, time passes by and you can spend hard-earned cash to get more advanced stories and be more powerful. The prototype version is still available to play: unity browser version is right here and downloadable version here.